Train for the life you want. 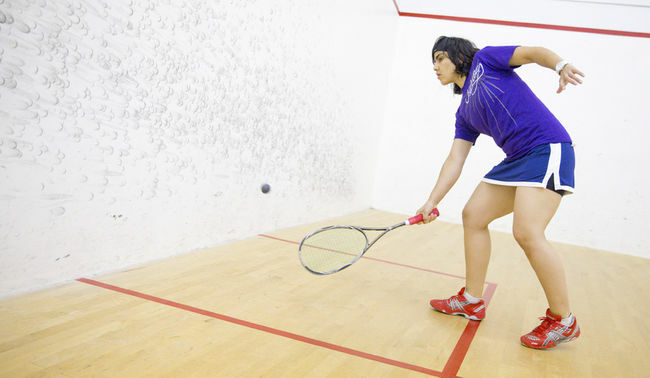 In order to play squash, the sport she loved, Pakistan’s Maria Toorpakai Wazir needed to be not only strong, agile, and coordinated—she needed to defy the Taliban. Maria grew up in the conservative tribal Pashtun society, where girls aren’t allowed the basic freedoms that we take for granted. Education is frowned upon, health care is denied, they’re often confined to the house and married off at a young age. They also aren’t allowed to play sports. So what’s a girl to do if she has big dreams and doesn't believe in that B.S? Answer: dress up like a boy, win their games, and never stop getting better. From an early age, Maria took on the guise of a boy, earning the nickname “Genghis Khan” from her admiring father. She took her warrior attitude to the streets, playing hard and eventually getting into weightlifting before squash caught her eye and her unending devotion. With the support of her parents and the director of the Pakistan Air Force Squash Academy, she began training, still disguised as Genghis. Everything was chill for about two months—that was the amount of time it took before everyone else at the academy realized that Genghis was actually a Maria. And that’s when the bullying started. Boys who lost to her were angry. The word spread. Maria not only faced harsh words at the academy, but in her daily life traveling to and from practice. No one could understand her freakish behavior. It hurt. But she didn’t give up, enduring the taunts because she knew she could compete. At sixteen, she won the bronze medal in the World Juniors Championship, and ranked third in the world in the under nineteen category. The accolades began pouring in, even from President Musharraf. But all this attention meant that the Taliban started to take notice of her as well. Her family began receiving threats: if Maria didn’t stop playing squash, something really bad would happen. Kidnapping. Death. And she was faced with a choice that she never wanted to make—would she bow to their demands, and give up the sport she lived for? Or risk the Taliban’s retribution? Ultimately to protect those around her (both her family and her fellow players on the squash court), Maria chose to stop competing in public. But she never stopped playing squash. For three and a half years, she played in her room at home at night when neighbors wouldn’t notice. She and her brother sneaked out to play on an abandoned court at night. Her father occasionally drove her to squash courts, changing his license plates often so as not to be caught. Anyone else would have given up, but not Maria Toorpakai Wazir. She emailed universities, clubs, and squash academies for three and a half years, hoping for training and a chance to play in exchange for her abilities as a coach. Canadian squash super star Jonathon Power got one of those emails. Blown away by her talent and tenacity, he arranged for her to train with him at his facility in Toronto. She packed up and took the next plane to Canada. Since then, Maria has become Pakistan’s No. 1 female player, and is currently ranked 62nd (and climbing) in the world. Watch Maria’s passionate speech at the 2013 TEDxTeen talk to learn more about her journey. We heart you, Maria! Support Maria's mission to empower girls around the world through education and sports.